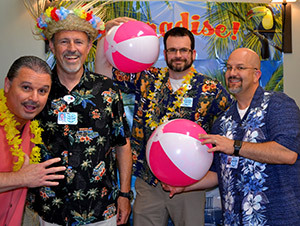 Grace Ridge Welcomes New Executive Director Chris Romick - Grace Ridge Retirement Community - Morganton, N.C.
Romick (far right) with team members Jeff, Dennis and JJ at Grace Ridge’s Caribbean Day celebration. 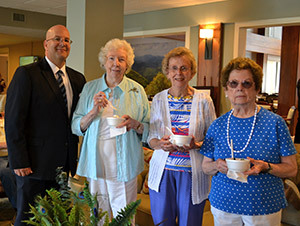 Grace Ridge Retirement Community welcomes Chris Romick as its new Executive Director. Romick will be responsible for overseeing the day-to-day operations of the Life Plan Community, which offers an active, independent lifestyle with a full continuum of care. “In those roles, Chris succeeded by developing financially sound communities with high resident satisfaction and team member engagement scores and we’re confident that he’ll have continued success at Grace Ridge,” said David Pope, vice president of clinical services, Carolinas HealthCare System Blue Ridge. Romick with residents Jane, Katherine and Ruth at a Residents Association meeting. Romick’s background provides a diverse knowledge of what it takes to develop a well-functioning community. Notable projects include a $147 million retirement community redevelopment, a $126 million start-up continuing care retirement community, and working with a groundbreaking amenity for senior living communities designed to make residents’ lives simpler, healthier and happier. The U.S. Navy veteran holds a B.A. in Gerontology Administration from Kent State University and an MBA in Marketing from American Public University. Romick succeeds Brenda Yost, who retired from Grace Ridge in January.